Hello Everyone. Hope you have had a wonderful weekend so far. It's time for another Sentimental Sundays Challenge! 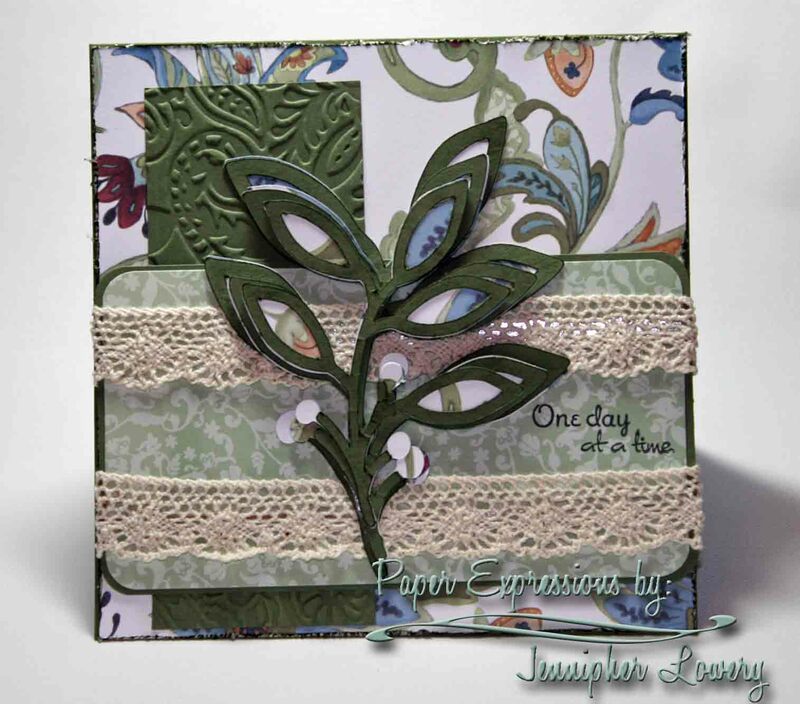 This week our challenge is to use die-cuts. But, not just standard shapes. We want you to get out your die-cutting tools and have fun. For this challenge, I decided to use my Cricut and Cindy Loo Cartridge which is quickly becoming a favorite of mine. I cut out three branches and three branch outlines in three different sizes and layered them with pop-dots to create a 3D look. Now, it's your turn to give it a try. Get out your die-cutting tools and step out of your comfort zone. Stop by Sentimental Sundays to see what my fellow team mates created. You're guaranteed to be delighted! Jennipher this is beautiful, great textures and I love the stress around the edges. So pretty Jennipher! I love the leafy images! 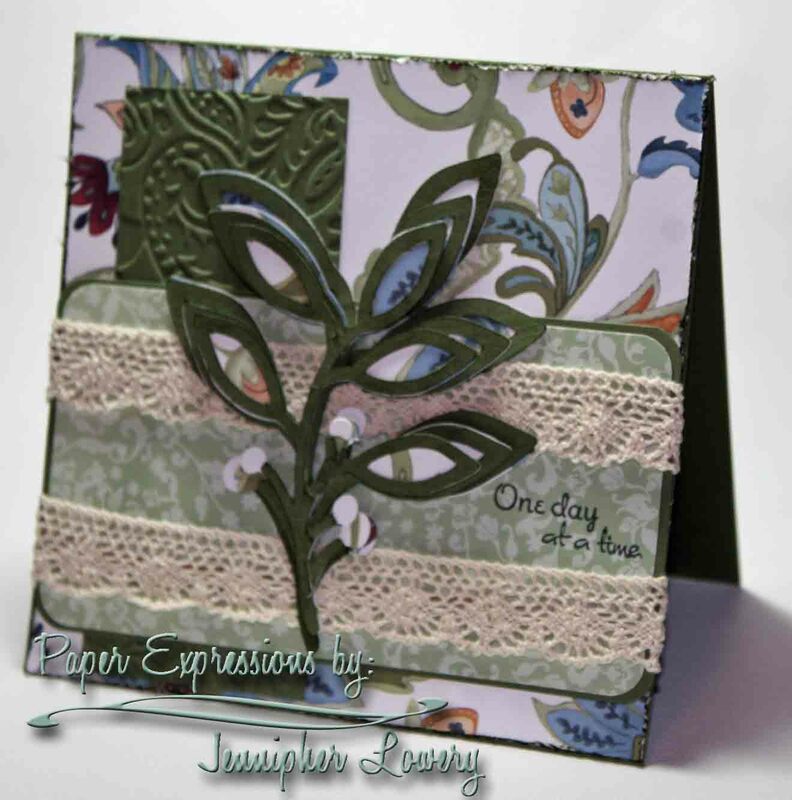 hun, i love the shapes and the papers and the wonderful lace on your creation! Simply a beautiful card. You were centainly blessed with talent. Thanks for sharing it with all. Hi Jennipher, Thanks for your lovely comment on my blog post. Your each card is unique. I just visited your other blot and now following. I really like that card too. I will try to enter mine quickly, if I am lucky enough...LOL! I just love your die cuts! They look fabulous with the papers you chose! Love the sentiment! Gorgeous card. Love your leaf die cut. This is really beautiful Jennipher! I love it...TFS!! !